Miserable riders waited for the L train at Myrtle-Wyckoff during the Thursday morning rush, as captured by commuter Ali Philippides. BROOKLYN — L train service was plagued with delays and then shut down between Manhattan and Brooklyn because of a "door problem" and a sprawling transit investigation into a signal failure somewhere along the line, according the MTA. 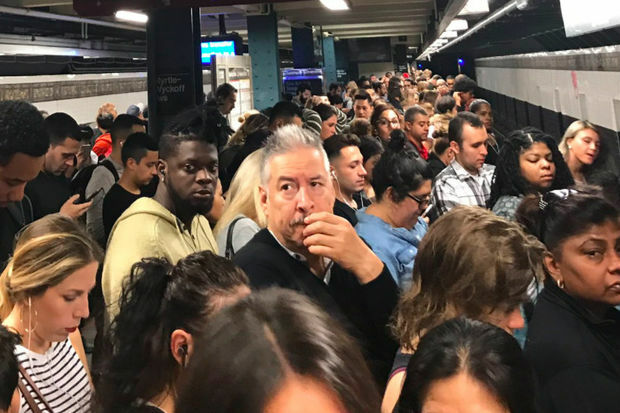 The faulty door at Bedford Avenue caused major delays starting at around 8:07 a.m and later cutting off service entirely, said spokesman Kevin Ortiz said. MTA workers couldn't verify that the doors of the train were fully closed so they had it out of service, but evacuate all passengers before doing so; a complex undertaking since the train had partially pulled out of the station, Ortiz said. Later in the morning, signal problems at around 10 to 10:30 a.m. somewhere between 8th Avenue in Manhattan and Rockaway Parkway in Brooklyn caused further delays, according to Ortiz. Both directions L train service is suspended between 8 Av and Rockaway Pkwy because of an investigation. Allow additional travel time. Straphanger Thalia Perez, 22, who tried to get on the train at Montrose Avenue said her voyage to Manhattan took over an hour, double her usual travel time. "Once inside it was just confusion as to [what was going on]. People were running in and out of the train trying to figure [it] out," she said, describing the chaos at the station. Other riders close enough to other connections abandoned the L train all together, walking to the nearest J, M Z trains or making their way to the waterfront to take the ferry, where that service too became overwhelmed with riders. Straphangers took to social media to decry the morning misery. Service resumed with delays at around 10:30 a.m., according to the MTA's website.